Some time ago I posted a list of the six CD’s that were in my CD player at that time, and I closed that post with a promise that I would write more about them later that week. That was, at this writing, just over two months ago. Wow. I have no excuse, other than to point out that this has definitely confirmed that time does, indeed, fly. (As if that fact needed confirmation.) Oops. Rather than write one long post that covers all six albums, I’m going to split them up and give each album its own turn to shine. I’ll try to cover one per week for the next six weeks. The first album that I want to talk about is my favorite from the group. That is Jimmy McGriff’s “The Dream Team.” There have been only a handful of truly great Hammond B-3 players. Among them are Jimmy Smith, Richard “Groove” Holmes, Jack McDuff and, the lesser-known but still great “Papa” John DeFrancesco, father to Joey. McGriff not only fits right in with them, he leads the pack, so to speak. A quick look at the rest of the folks involved in creating this great disk will suffice to prove the title is not merely puffery. David “Fathead” Newman, tenor sax. Red Holloway, tenor and alto sax. And the recording engineer was the legendary wizard of Englewood Cliffs, New Jersey, Rude Van Gelder. Looking at that roster, one can see that it would be difficult to imagine a group of jazz musicians alive at that time (August 19, 1996) for whom the title would be more appropriate. The liner notes point out that this same group, with Rusty Bryant filling the role that Red Holloway has here, also produced an earlier recording with Jimmie, “The Starting Five”. 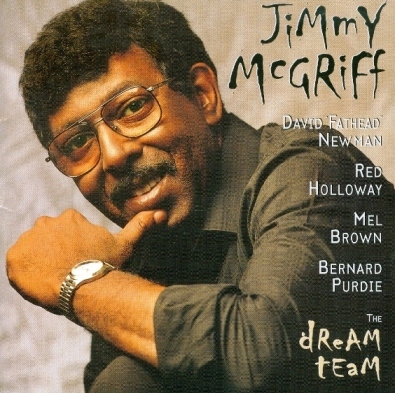 Track one of “The Dream Team” is a lively tune David “Fathead” Newman wrote called “McGriffin'”. It gets the set off to a delightful start and allows all participants ample opportunity to show their stuff early on. Newman and Brown especially shine in this number, which Newman wrote for this album. Willie Nelson’s classic “Ain’t It Funny How Time Slips Away” follows, with Jimmie setting the tone, followed by Brown and then the two saxes. Purdie does some wonderful brush work and it’s just all so fine that it makes me nostalgic just writing about it. I couldn’t agree more. McGriff went on to record half a dozen more albums before his death on May 24, 2008. All are good but none are better than “The Dream Team”.